After being delayed from late last year. Beautiful pixel art police procedural Beat Cop was supposed to release late last year, but it was delayed to Spring 2017, to give developer Pixel Crow time to make a few improvements. My personal groundhog informs me that it's now Spring 2017, and hey, Beat Cop is coming out next week. On March 30, to be precise. 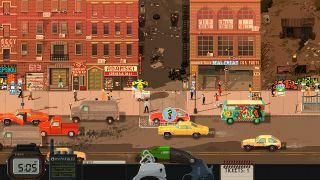 It's a top-down, non-linear adventure game about a beat cop (you), who has to defend the streets of Brooklyn from 1980s bad guys, while eating tasty-looking donuts and, shhh, maybe taking the odd bribe if you're determined to head down a crooked path. You can find Beat Cop on Steam, on GOG, and from the Humble Store.